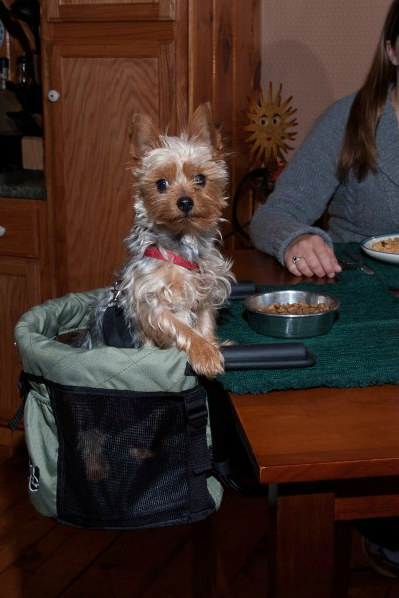 I have written – with disgust–about kids on leashes and dogs in strollers. The former spawned a call from Dr. Phil to try to get me to come on the show and duke it out with the leash supporting moms of America. I am always astonished at the lack of separation out there between parenting kids and owning pets. Now, don’t get me wrong, I love my pets. Losing Mel was one of the hardest things in my life, and now having Iko and nurturing a young puppy is a whole new set of emotions. But I never once confused them for my kids. Or felt I was parenting them. Not to say putting my toddlers in a crate to discipline them wouldn’t have come in handy, but a dog is a dog. A kid is a kid. And the idea of taking the methods used in raising one and projecting it on the other is concerning. Note there are more than one of these on the market indicating there is demand or people are trying to create one. Crazy stuff. And if you ask me all these dogs look a little out of their minds and certainly over-indulged. The last one is really scary. Is she eating flan with a straw and a paw candle with a side of bisc(uit)otti? 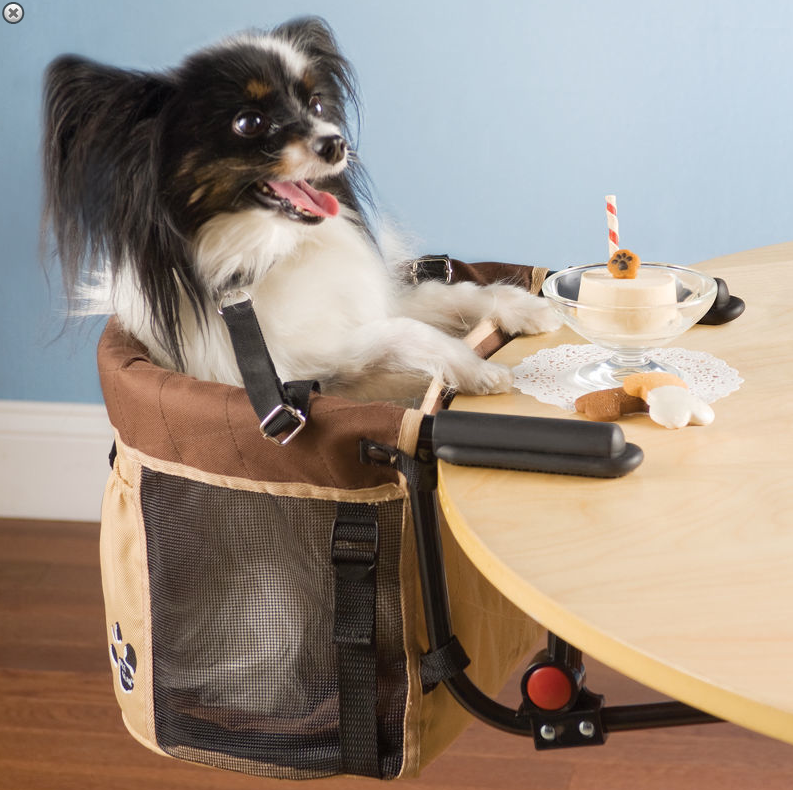 oh man… just when I think I have seen it all… dogs in highchairs? I am with you on this 100%. I feel sad for the 90% reasonable, level headed humans that have to put up with the other 10%! I have seen some pretty disgusting things coming out of children in high chairs and they throw things too like peas and corn etc. A little dog is not messy, not as messy as a child. If a person is a responsible and good owner of their dog they will be clean. The owner will disinfect those seats. If they love their pets enough to treat them in a very human way they will be the types to clean up after their dogs too. People who don’t care just don’t care they never pick up their dogs poop while walking them either. So, you find a person who respects their animals they will respect people too. I have one and I can tell you my little dog is cleaner than a child. She doesn’t not throw food, does not cry or bark, she sets there in her little chair and waits to be fed and when she is she’s not messy. I’ve seen worse things in grocery stores with kids than with dogs. Kids poop and pee in their diapers in the shopping carts and drool and snot on them. Small dogs just sit there, they don’t poop, pee, bark, bite, scream, yell, throw fits and make it a living hell for others who are trying to shop. So, “think” about these things when you go shopping next time and some kid is making it a living hell for the rest of us! No No No! And I hope I never get an invite to the home of someone who has one. People who love their animals do these kinds of things nothing wrong with it if its a little dog. How would you like to me on the cold floor all the time. Dogs and cats are 100% better then most people. I trust them more then I do people. I so agree with you! The things I have seen kids do in stores is unbelievable. The things I have seen parents do with their kids even worse. Like changing your kids diaper and leaving poop and pee all over the changing table. How disgusting!! People are worried about animals spreading things, no humans speak diseases not animals. If you are a responsible owner, keep your dog well groomed, have their vaccinations up to date, feed them well and love them well they will be great members of a family. I wish I could say this about some peoples kids. Is it the kids fault no its the parents fault. Train your kids like we train our dogs, to behave in public. 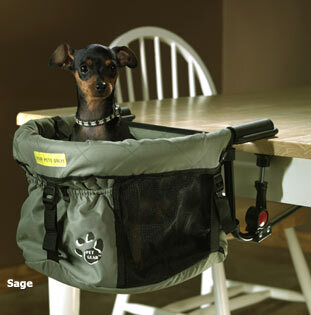 They have dog seats with trays built into them, which should be used with children too. No I don’t want my dog eating off my table that is gross, I don’t want my kids eating off my table or and adult either.